Stocks are now at THE line. The Friday meltdown brought the S&P 500 to critical support (red line). It was only through abject manipulation that the PPT was able to keep stocks there. 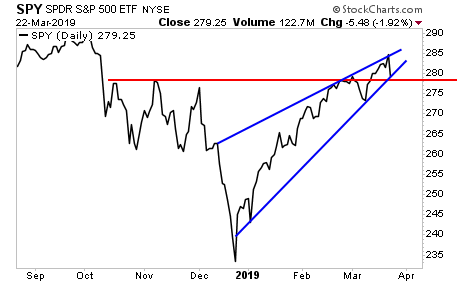 The bearish rising wedge formation (blue lines) that was guided price action since the December lows remains intact… for now. Unfortunately that’s where the good news ends. 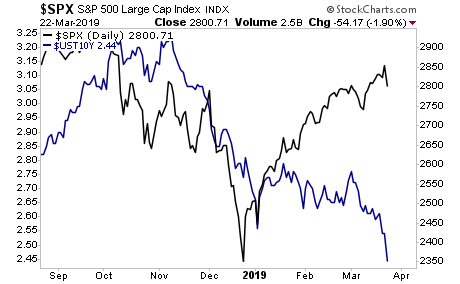 If we look for leading risk indicators in the market, then it looks as though stocks are going to soon collapse. 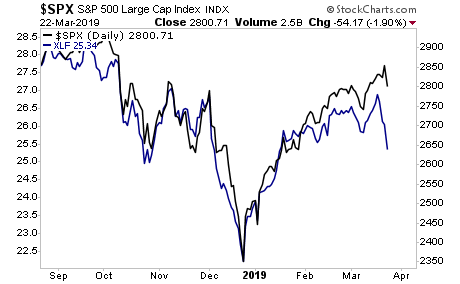 The financial sector (blue line) tends to lead the S&P 500 both to the upside and the downside. 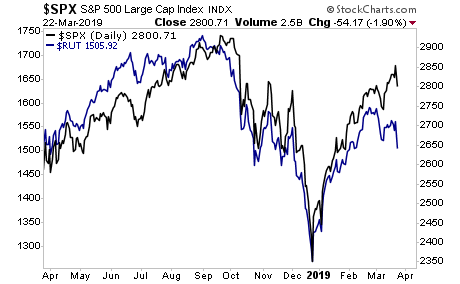 Right now it’s telling us that the S&P 500 should be at 2,600 or so. Russell 2000 (blue line) is another leading risk indicator. It too now it’s telling us the S&P 500 should be at 2,600 or so. And then there’s the bond market, where the yield on the 10-Year US Treasury (blue line) is telling us that stocks will take out the December lows. Unfortunately... bonds are the smart money here. A Crash is coming and smart investors are already taking steps to prepare for it. Today is the last day this report will be available to the public. We extended the deadline based on Friday's action, but this it IT... no more extensions.